The Missoula Chamber of Commerce joined the Missoula Downtown Association this week in supporting the deconstruction of the Mercantile to make way for a new hotel and retail center proposed for the property. The Missoula Chamber of Commerce became the latest membership organization this week to place its support behind redevelopment of the Mercantile property, saying the location has great bearing on city commerce. Sam Sill, director of government affairs for the Missoula Chamber, said the board of directors voted unanimously to support a proposal submitted by HomeBase, a Montana developer, to deconstruct the Mercantile and put the property back into use as a center of commerce and activity. 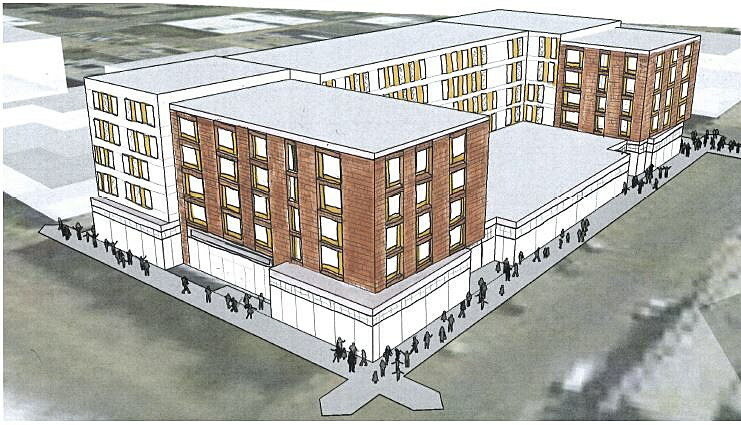 The chamber board reached its decision after attending several presentations by HomeBase on its proposal to deconstruct the Mercantile and construct a new $30 million hotel with ground-floor retail on the property. Sill said the chamber also surveyed 1,563 people in the community, including its members, asking if the mercantile should be deconstructed “to make way for new businesses to use the site.” He said 86 percent of respondents were in support and 14 percent were opposed. Earlier this month, the Missoula Downtown Association also placed its support behind the proposed redevelopment of the Mercantile property. While efforts have been made to save the building over the past several years, the organization said, none have succeeded. MDA said the proposed hotel project fits with the city’s Downtown Master Plan. The organization also believes the HomeBase project will revitalize the block and add new energy to the city’s core. Surrounding business owners have also voice support for the project. The Missoula Historic Preservation Commission has heard from both sides of the debate in recent months. Opponents of redevelopment have taken to social media in an attempt to block redevelopment, though their effort has not netted the funding needed to purchase the property. An organization formed to “Save the Merc” has also launched a fundraising campaign to pay for legal counsel specializing in real estate law. As of Thursday, the fundraiser had netted $2,000. The preservation commission was set to vote on the HomeBase application to deconstruct the property at its last meeting. After four hours of testimony, however, the commission postponed the decision to next month.